December 22, 1922: This day is the first double wedding ceremony broadcast on WEAF. This is proof that WEAF could be a pillar of radio promotion; the wedding ceremony at Grand Central Palace was watched by 4,000 spectators. 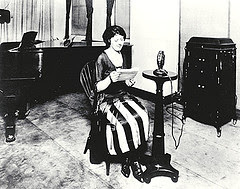 The WEAF coorperated with the American Radio Exposition to conduct this classic radio broadcast and participating wedding couples received $100 as compensation. As the pioneer sponsored program broadcasting station, WEAF use long distance telephone service to broadcast their program. WEAF made arrangment between sponsorhip company and others radio stations that would be the chain station for equal distribution of service cost. The chain station received a portion of advertising program fee or could obtain non advertising program of the chain management for a fee.